The arrival of the World of Warcraft expansion Wrath of the Lich King is being heralded by a zombie invasion - but it's the players themselves who are being turned into shambling undead. Reports are "flooding in" about a zombie uprising in the game, caused by infected crates found in the town of Booty Bay. 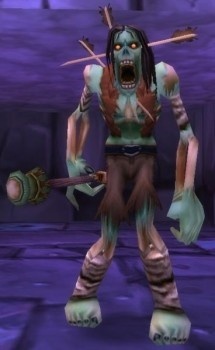 Eurogamer reports that diseased players have ten minutes to be cured by healers from the Argent Dawn faction or by other players with the "Cure Disease" spell, or they become zombies, hostile to everything in the world except other undead. Players who are turned get a new zombie skill bar, along with the ability to spread the undead plague to other players, but once they join the legions of the undead, the only way out is death. "You can no longer cast the spells/abilities that you had as a normal character, and formerly friendly NPCs now consider you an enemy. You can, however, cast new, unique zombie spells," Blizzard wrote in a "Zombie Infestation Survival Guide" posted on the World of Warcraft forums. "As a zombie, you are part of a special faction that is friendly with all zombies and can converse with them, regardless of whether they were part of the Horde or Alliance in their mortal existences." The Argent Dawn healers have appeared throughout the World of Warcraft in response to the plague and will automatically heal nearby players, but some people still aren't terribly pleased with this recent turn of events, particularly those who don't enjoy PvP combat. Unlike the Corrupted Blood plague, however, this one looks fairly easy to contain and control - although at least one Blizzard staffer has posted an ominous-sounding message in the forums obliquely implying that situation could change. That zombie in the picture looks quite surprised at the whole thing. Its a 'OMFG, ARE THOSE SHOES ON SALE!?' kind of look. Seems like he needs them, at least. Excellent! Now for the 10 points... Hmm... It turns out that I can't give points. Damnit! Respect mah authoritah! Everyone is going zombie mad. A friend just told me that GTA4 is going to have zombies as it's 360 exclusive content, sound like BS to me, but he's been right before. I saw all these Zombies in Shatt last night and couldn't figure out what was going on! General chat exploded in torrents of "WTF" from other players. It was awesome. Dude, I don't play WoW, but this sounds kind of hilarious. I can see why folks would be pissed off, but it sounds pretty easy to cure. I wonder if they're friendly with Undead players from the Horde? Or just folks turned into zombies by the plague? That Corrupted Blood -Incident sounds awesome. I've heard even scientists were interested from the player reaction to it. "THOSE SHOES GIVE ME AN EXTRA TEN HEALTH REGEN PER BRAIN I EAT! MUST HAVE! THAT, AND THEY'RE ALSO FABULOUS DARLING!" My friend was on and saw all of 'em in Shattrath thinking it was a raid. He killed a bunch and got spammed with tells of "WTF, why'd you do that?" He thought it was hilarious. WoW already has a zombie invasion, it's called "Its player base"
Actually, that is an awesome idea. I think that GTA would be a great engine to run a "city overrun by zombies - survival" kind of game. Probably the best Halloween stunt they could have pulled, it's perfect! There were studies done in-game, as it was one of the few opportunities pathologists had to study a mass outbreak of easily communicable disease. The way people reacted to getting it was actually pretty insightful at first, but eventually degenerated into people spreading it for fun and hilarity. COH has a zombie invasion too... hurray for individuality? That's the neat thing, you become friendly with all scourge (the playable undead class are the Forsaken. The scourge are the mindless--and sometimes not--undead hordes controlled by the lich king). You can communicate and trade with the other faction as a zombie, and you can even go to certain instances and walk the whole instance as a zombie without being attacked. One of the dev posts on the forums suggested that you could find new friends to talk to. We're still trying to figure out whether that means a secret quest you can only do as a zombie or that you can simply communicate in the Zombie language with horde and alliance. This is going to be one awesome event! This is the most awesome thing ever. brb reactivating my WoW account. That would be so awesome. I'd lock myself in a room for three days and improvise all kind of wicked scenarios. "Get to da choppa": While on foot, make it from the western island to Brucie's chopper. "Survival mode": Come get some you zombie mu'a'fu'as. And so on. It would probably need modes made specifically for it to not lose its novelty right fast, and the game might sputter and die with all the zombies on screen (or - even worse - they'll just have a very underwhelming zombie horde) but all in all, a zombie invasion and a whole city to run around? Where's the catch? That I might die of sleep deprivation? Pushaw. I'll show those Violet Eye bastards what they get for not giving me a new signet! So will this be a permanent thing? or just a little stunt? Because its quite fun, although I feel if it goes on too long, it will just get annoying. Its to promote the upcoming Wrath expansion, like how prior to TBC demons attacked. I don't think its permanent, and the storyline will probably follow to the source of the infliction, which is - of course - Northrend. Interesting. Can you still quest in that zombie form? I would propably get the curse on purpose to go slaughter my friends. Yeah I knew it was a promotion thing, but I didn't play prior to TBC, would be kinda funny though if it was a permanent thing. That's pretty funny, I'm going to have tot rick my friend into becoming a zombie. Ok i mnot sure if anybody has posted anything yet but as me being a massive wow geek i thought id enlighten some of yous, This so called zombie invision has ended last night so no more zombie fun (though new kara boss will still be arround for a while) The whole story about these zombies is infact the scourge army controlled by Aratha the new lich king. The scourge army was orginaly controlled by the first lich king who was empowered by the Burning legion to help take over the world and kind of killing everything before they got here but the then lich king was angry of how they had condemed him and tried to break free of thier control and was imprisoned in a throne of ice. Then came along arathas who in his first for power wanted to deafeat the scourge army and get rid of his father who at the time was king and become the ruler of azaroth. Arathas killed his father and came across the ice throne and the corrupted blade ice mounre wich turned him evil and he took control of the scourge army that is now attacking all major cities. well i think that covered most important things if i missed anything or anybody wants to know more deatials feel free to message me. I really want it to become a permanent thing. Get rid of the crates and basically explain it that the virus is already loose in the world. However if you die and resurrect by going to your corpse you have a 1/20 chance as coming back as a zombie. If you inflict even 1HP damage in close combat to another character then that char has to be healed in 10 minutes or they turn. Why only have it as a promotion thing then ditch it ? Considering the new lich king is not gonna just disappear it would make more sense for it to remain. For a self-confessed WoW geek that writing was horrible. "Ice mourne"? Really? It was such a fun event. the streets of all the major citys were littered with zombie corpses... So many whiners though which was a shame.